When it comes to ensuring that your paint project is a success, there is no more important place to start than room preparation, including cleaning, sanding and priming walls before painting. While not every surface will require multi-step preparation, we encourage you to thoroughly check surfaces prior to painting and take action where needed. Watch this video to learn the recommended process for cleaning interior walls prior to painting. As seen in our How to Prep Walls for Painting video, clean walls are key in preparing a room for painting. While there is no best way to clean walls before painting, most walls can be washed using a sponge and warm water. For surfaces that have exposure to oil or grime, like kitchen walls, wash with a solution of water and grease-cutting detergent and follow up with clean water to remove any residual cleaning agent. Finish by wiping the walls with a damp cloth. The most important part of the process is to make sure you let everything dry thoroughly. Applying primer or paint to walls that are still damp can cause a host of issues, including blistering. No matter which room you’re preparing to paint, make sure you address any mildew first. Never paint over mildew—it will grow through new paint, which will make subsequent cleaning and maintenance even more difficult. You can clean mildew with a sponge and a solution that is three-to-four parts water to one part bleach. Apply the solution, allow it to set for a few minutes, scrub the affected surface with a soft brush, and rinse the area with clean water. Make sure you wear gloves and goggles and allow time to dry. While sanding is not required for every paint project, rough spots on walls, whether they have been previously painted or not, need to be sanded before they are painted to ensure the paint goes on smoothly. Use sandpaper or a sanding block to dull any uneven surfaces, wipe away dust with a damp cloth and let dry thoroughly. Smoothing walls before painting is necessary for surfaces previously painted with a gloss or high-gloss paint. For previously painted water-based paint, sand with a fine-grit sandpaper. For oil-based paint, a medium-grit sandpaper (100- to 150-grit) should be used. Again, wipe away any debris and allow to dry completely. Cracking or flaking paint on previously painted surfaces can also be an issue. Paint cracking on walls and ceilings happens due to a variety of causes, one of the most common being poor preparation of a surface prior to painting. Painting over cracked paint is a bad idea; it is important to remove any flakes from the surface via sanding or scraping before repainting. 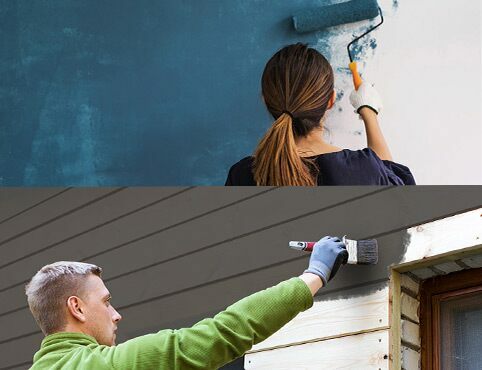 If paint and paint colour make a home, then primer is that home’s foundation. Use a primer to get the most out of your paint, especially if your walls are porous or have surface stains that need covering up. Primers disguise imperfections, create a smooth surface for your paint to lock onto, and ensure a uniform finish no matter what you’re painting. There is a primer for every project and substrate. 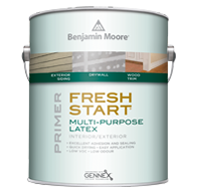 Benjamin Moore’s Fresh Start® line of premium interior primers offer products that provide excellent hide on nearly any surface, even for projects with a significant colour change. Benjamin Moore does not recommend painting over wallpaper, especially if you have wallpaper with a high sheen or a heavy texture. Even the best, most premium paint will not hide wallpaper seams. We strongly recommend you hire a painting contractor to remove wallpaper, prepare walls for painting after wallpaper removal and to complete your painting project.